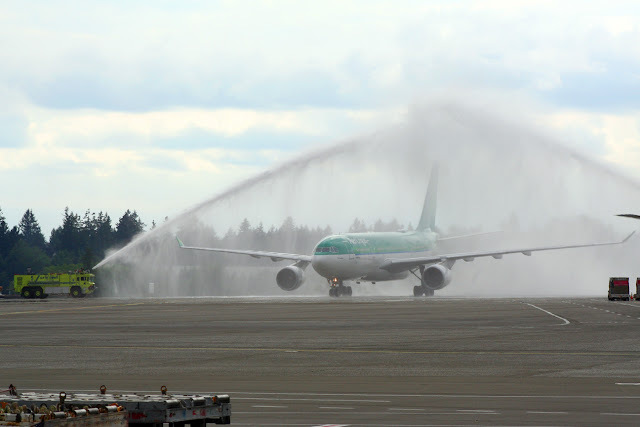 Aer Lingus, the carrier most associated with Ireland, began non-stop service between The Emerald Isle and The Emerald City on May 18, making Seattle its third West Coast gateway. The carrier’s first flight from Dublin Airport (DUB) arrived at Seattle-Tacoma International Airport (SEA) and was welcomed by a water turret salute under partly cloudy Friday afternoon skies. 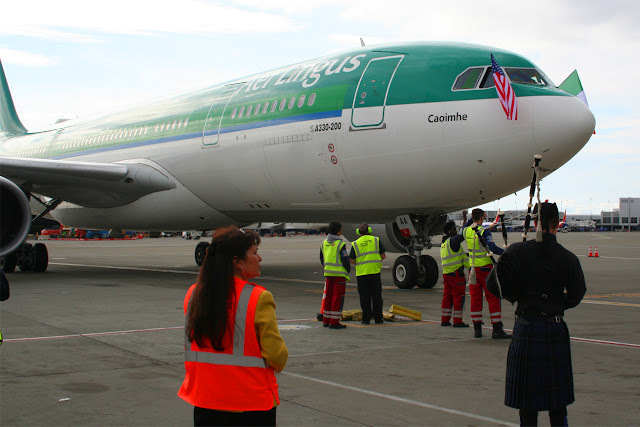 The pilot and first officer unfurled flags of the two countries, then taxied to the gate to the accompaniment of bagpipes. Prior to the flight's early arrival, dignitaries from Sea-Tac Airport, the Port of Seattle, the office of Seattle Mayor Jenny Durkan and other called the commencement of service by another new airline one of the best things that could happen to the airport, as well as the two major cities in both countries. "Up until today, Dublin has been the largest European destination that has not had direct service into Sea-Tac, which is why this is so exciting," Stephanie Bowman, one of the five Seattle Port Commissioners, said, noting that the two metropolitan areas have much in common. "Our high-tech sectors are booming in Seattle as well as in Dublin," she said. "We have great beer, we have great coastlines and, of course, we have great weather ... occasionally." Many, including Bowman, spoke of their Irish heritage and chatted amiably at the gate while others attended to the arriving flight. The flight, aboard an Airbus A330-200, was the first pre-cleared trans-Atlantic flight to fly into Seattle, meaning passengers and their luggage were cleared for U.S. Customs before departing Ireland and did not need to go through customs at Sea-Tac. Unquestionably, that was a real time-saver for those aboard. Commissioned in 1973, the international arrivals hall at SEA is the oldest in the U.S. and its territories and, although a new facility is being built, current wait times to clear customs and immigration can often be lengthy. With the commencement of non-stop service, Seattle joins San Francisco International (SFO) and Los Angeles International (LAX) as the airline's West Coast gateways. 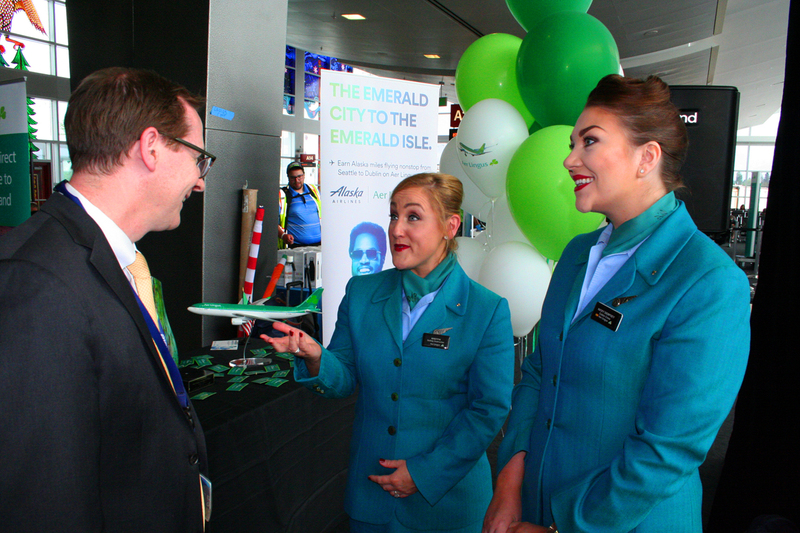 Aer Lingus also operates direct flights to 10 other major cities across the U.S. While Aer Lingus is not typically characterized as a “bargain” carrier, it does share some of their less desirable traits. According to a 2017 report, Aer Lingus derived 12.6 percent of its total revenue from ancillary revenue, averaging nearly $21 per passenger. Ancillary revenue comprises revenue from à la carte charges, commission-based products, frequent flyer activities, miscellaneous sources such as advertising, and the à la carte components associated with a fare or product bundle. Aer Lingus offers five types of fares, some of which come with à la carte components. 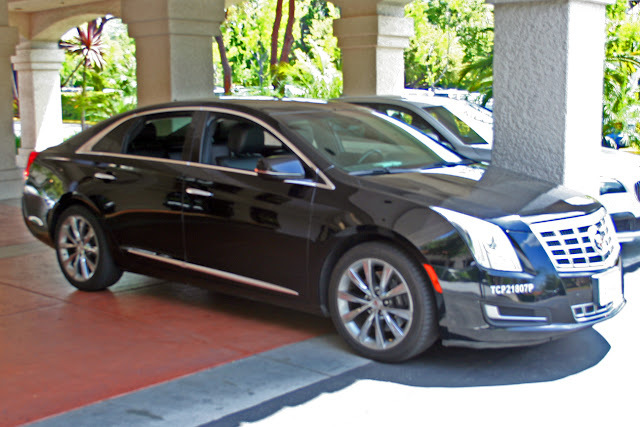 Economy fares include Saver, Smart and Flex while Business fares are Business and Business Flex. The economy Saver fare is less basic than many similar fares, and for trans-Atlantic flights includes a meal and a carry-on bag. It does not include a checked bag, advance seat assignment or complimentary headphones and blanket on board. Among the perks included with Business-class fares are dedicated check-in, priority boarding and access to the airline’s lounge. An area where the airline is aggressively embracing à la carte charges is food, at least in economy. According its website, economy passengers on trans-Atlantic flights are provided a complimentary meal or their choice from a selection of pre-order meal options. Those options include steak, salmon or chicken, with prices ranging from €24.99 to €32.99. Importantly, special meals must be pre-ordered at least 24 hours before take-off, and that can only be done on-line. Want a beverage before or with your meal? The in-flight menu shows miniatures of several types of beers, spirits and premium spirits on offer for between €5 and €7, which is pretty standard, but if you want a mixer with your spirits – say, club soda or Coke – it’s another €1.50 for something most carriers provide free of charge. 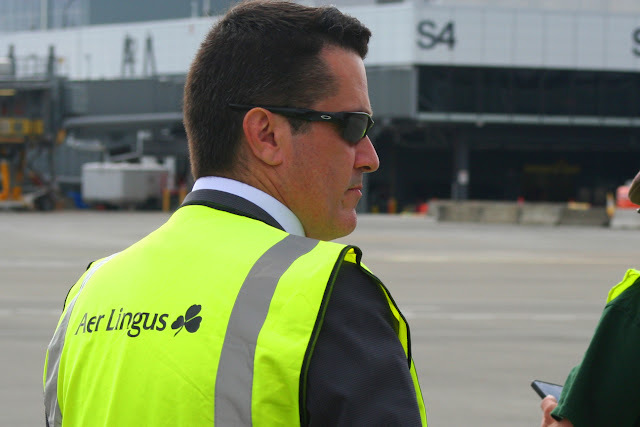 Aer Lingus is part of the International Airlines Group (IAG), a Spanish-registered company that is also the parent of British Airways, Iberia, LEVEL and Vueling. As such, its embracing of à la carte pricing is not particularly surprising. A few years ago, I decided against taking British Airways – which had long been a favourite of mine – because the carrier has adopted the practice of charging passengers who wish to reserve seats more than 24 hours in advance of their flight. Unwilling to risk being stuck in a middle seat for the 9-1/2 hour flight to London (LHR), I would have to have paid $45 each way to reserve aisle seats in the center section of the Boeing (NYSE:BA) 777 I'd be riding. Sitting in the section next to the window would have cost even more. Finally, potential passengers should understand that Aer Lingus offers only two classes. According to SeatGuru.com, Aer Lingus has only Business and standard Economy seating; none of its aircraft have a premium economy section or a First Class cabin. The A330 that landed in Seattle has 23 flat bed Business Class seats that are 21 inches wide with pitch of 58 inches, which is competitive with other airlines' long-haul aircraft. The plane also has 243 standard seats that are 17 inches wide with 31 to 32 inches of pitch. That is a tight fit in any case, and especially so for a flight of a little over nine hours. For travelers who want a non-stop from SEA to DUB, Aer Lingus is their only choice. Those willing to endure a stop-over and possibly pay a somewhat higher fare, however, have plenty of options. At the time of this writing, the Aer Lingus website returned a Smart fare of $2,071 for the round-trip between SEA and DUB. Icelandair, which has slightly more room in standard economy, also offers premium economy in addition to its Business class. Its round-trip fare of $2,475 could include a stop-over of up to three days in Reykjavik for those who want to see (or say they’ve been to) Iceland. United Airlines (NYSE:UAL) offered a flight with a stopover in ORD in Chicago for $2,378 while Delta Air Lines’ (NYSE:DAL) round-trip passage was considerably more expensive, at $3,473 for the round trip. In addition, Delta’s flights connect at either JFK in New York, CDG in Paris, or AMS in Amsterdam. Lufthansa also offers flights connecting the two cities, though the fare is comparable to Delta's fare and involves layovers in Frankfurt (FRA). 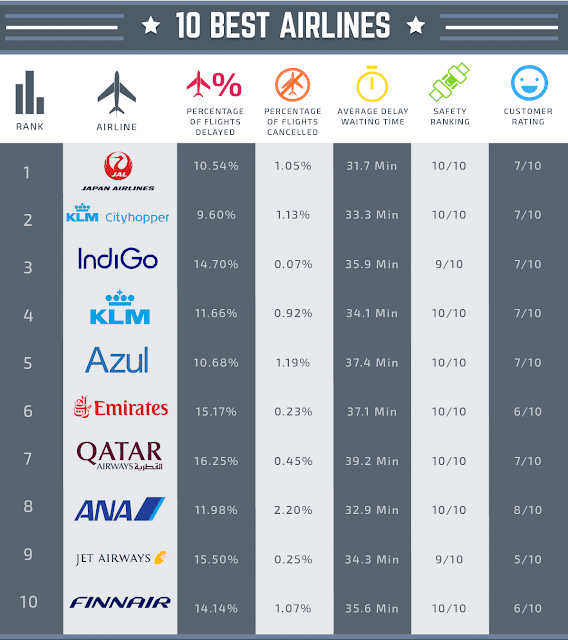 The least expensive option was a combination of flights on United and SAS. 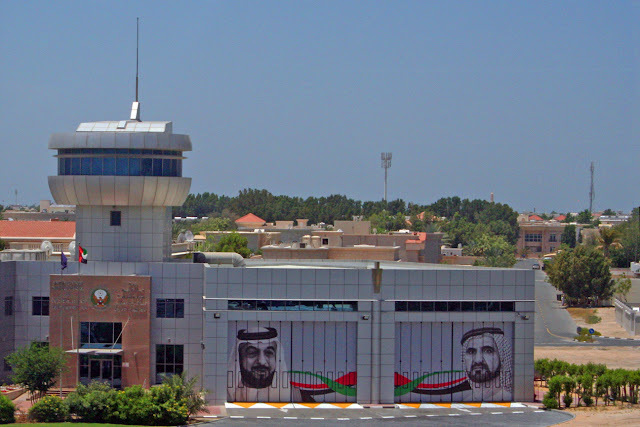 While that itinerary had two stops in each direction and lengthy trip times, the round-trip fare was only $1,401, according to Google flights. As for me? I prefer a non-stop. But Business Class, please.